Conference series is hosting the 15th World Congress on Endocrinology and Diabetes (World Endocrinology 2019) at Prague, Czech Republic during September 20-21, 2019.World Endocrinology 2019 Conference is based on the theme of To "Transform and connect innovative therapies in Diabetes and Endocrinology." World Endocrinology 2019 welcomes all the Endocrinologists, Diabetologists, and other medical & clinical experts working the arena of Endocrinology, Metabolic Syndrome and related field to this upcoming World Endocrinology 2019 Prague, Czech Republic. 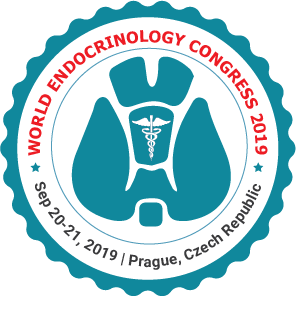 World Endocrinology 2019 conference brings together experts, leading researchers, scholars, scientists, professors from fields of Health care, Endocrinologists, Diabetologists, Nutrition, Physicians, Nurse practitioners and other related areas to interact and exchange ideas about the state of the art technologies related to Endocrinology and Diabetes. The conference will also provide an insightful understanding to the issues arising out of the Endocrinology and Diabetes and the future concern and remedies from that. World Endocrinology 2019 provides an opportunity to interact with eminent Scientists, researchers, Business Leaders, experts from all over the world. The little effort put by the World Endocrinology 2019 will help in taking a giant step in the field of Health care. One- to-one interaction, B2B, and B2A etc. Individuals may submit up to two regular abstracts as the first author. Individuals may submit an unlimited number of Trials in Progress abstracts. Individuals may serve as a co-author on an unlimited number of abstracts. All types of Diabetes, Endocrinology, Medicinal, Health research are eligible for submission. Abstract should address scientific questions, detail clinical observations, or contain primary scientific data. Data from the long-term follow-up of previously presented clinical trials may be submitted only if significant new information can be shown. 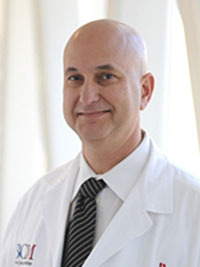 Interim analysis of a prospective randomized clinical trial will be considered if it is performed as planned in the original protocol and is statistically valid. Abstracts of clinically-related subjects should be combined into a single abstract. Note: Submission of multiple abstracts on a single study may result in the rejection of one or more abstracts. 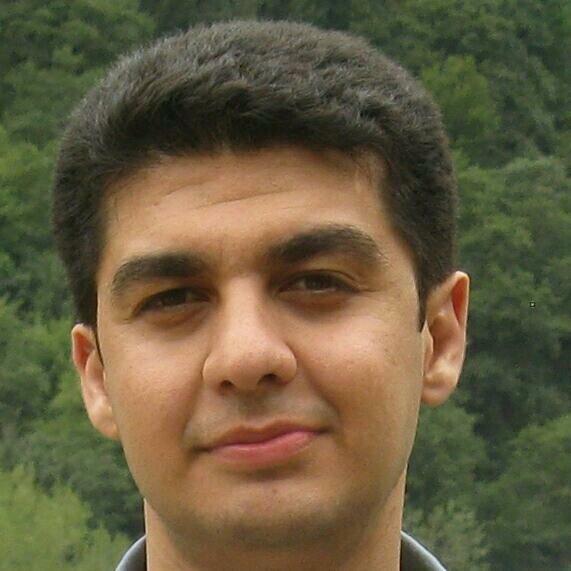 Provide your full name, academic degree(s), institution, address, and email address and recent photograph. You will receive all future correspondence from us regarding the status of your abstract. The selected abstracts will be published in Conference Proceedings. An Endocrine Disrupting Chemical (EDC) or Endocrine Disruptor (ED) is any chemical that can interfere with normal hormone functions in humans and/or Endocrine Disrupting Chemical animals. The human endocrine system is a collection of glands which secrete different types of hormones that regulate the body’s growth and metabolism, sexual development, and behavior. Naturally occurring hormones are usually active at very low doses. A healthy endocrine system is essential to the normal functioning of the human body. Call for proposals are open for oral papers, panel presentations and scientific posters across the list of tracks highlighted in our website and papers on other topics not listed are also welcome if they meet the objectives of the conference. We hope and expect World Endocrinology 2019 theme to inspire a number of research avenues, and look forward to discussing ideas, findings and synergies, in this International Academic Forum. Growing incidences of endocrine disorders such as hyperthyroidism and adrenal insufficiency is predicted to boost the demand for endocrine testing.The growing diabetic, geriatric and obese population worldwide is expected to promote the market growth. Furthermore, growing healthcare awareness among individuals coupled with increasing government support is expected to increase the diagnosis at an early, thereby contributing to the growth of the endocrine testing market. Owing to increasing health awareness around the world, there have been advancement in home health care along with easy operating home diagnostic kits which are cost effective and designed with precision. Many new mass spectrometric technologies have been introduced which deliver accurate results in less time and they are highly sensitive. Mass Spectrometry is now coupled with liquid chromatography for more precision. Telehealth services have also been introduced by some commercial laboratories and stand-alone clinics. Based on test type, the market is segmented into Estradiol (E2), Human Chorionic Gonadotropin (hCG), Follicle Stimulating (FSH), Dehydroepiandrosterone sulfate (DHEAS), Progesterone, Luteinizing Hormone (LH), testosterone, thyroid prolactin, Thyroid Stimulating Hormone (TSH), cortisol, insulin, and other tests such as gastrin, thymosin, and secretin tests. Thyroid stimulating hormone (TSH) test accounted for a lucrative share in 2016, This can be attributed to the increasing incidences of TSH-related disorders and the growing awareness regarding correlation between variations in the thyroid hormones levels and cardiovascular disorders. Insulin test is anticipated to witness the fastest growth over the forecast period. The substantial rise in the diabetic population and the growing awareness about diagnosis are anticipated to contribute towards the demand for insulin test over the forecast period. 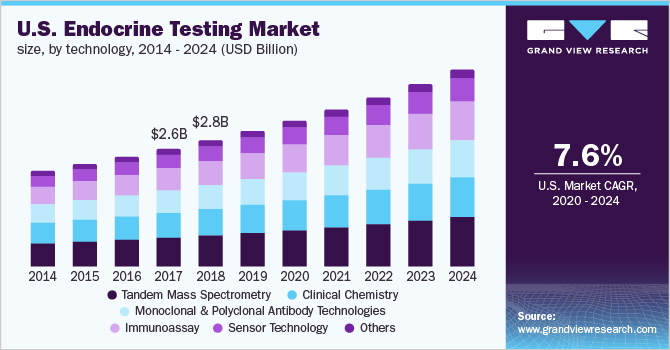 Key technology segments include tandem mass spectrometry, immunoassay, monoclonal & polyclonal antibody technologies, sensors, clinical chemistry technologies, and others such as Liquid Chromatography with Mass Spectrometry (LC-MS). The tandem mass spectrometry is expected to dominate the market during the forecast period. This can be attributed to growing use of tandem mass spectrometry in combination with liquid chromatography which helps in overcoming the challenges associated with traditional techniques used for endocrine testing. 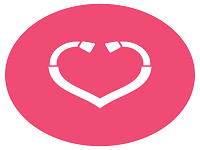 Sensor Technology is expected to show the fastest growth among all the segments owing to growing use of biosensors in glucose monitoring for diabetes which is used on routine basis by the individuals to monitor their blood sugar level in undiluted blood samples. 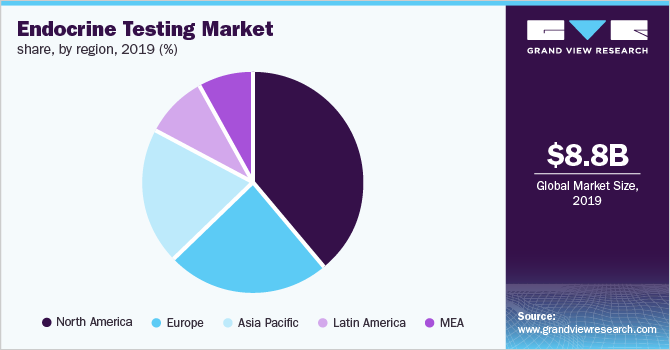 The major share in endocrine testing market share is held by companies such as Abbott Laboratories, AB Sciex, Agilent Technologies, Biomedical Technologies, bioMerieux SA, Bio Rad Laboratories, DiaSorin, Hoffmann-La Roche Ltd., LabCorp, and Quest Diagnostics. The players are actively involved in launching technologically advanced products and initiate collaborative developments to sustain themselves in the competition. For instance, LabCorp offers all-embracing solutions on clinical trials pertaining to diabetes and all other hormonal diseases. In addition, the company also provides liquid chromatography in combination with mass spectrometry to yield specific results even with minimal amounts of the hormonal sample. The 14th World Congress on Endocrinology & Diabetes (World endocrinology 2018) convoked by Conference Series during November 21-22, 2018 was successfully held at Holiday Inn Paris – Marne La Vallée with a theme Reconnoitering the Challenges Concerning Endocrinology and Diabetes Research” was a great success where eminent keynote speakers from various reputed institutions with their resplendent presence addressed the gathering. Thanks to all our momentous speakers, conference attendees who contributed towards the successful run of the conference. World Endocrinology 2018 witnessed an amalgamation of peerless speakers who enlightened the crowd with their knowledge and confabulated on various new-fangled topics related to the fields of Healthcare. World Endocrinology 2018 Organizing Committee would like to thank the Moderator of the conference, Denial, who has contributed a lot for the smooth functioning of this event. Conference Series is privileged to felicitate World Endocrinology 2018 Organizing Committee and Chairs who supported for the success of this event. Conference Series would like to thank every individual participant for the enormous exquisite response. This inspires us to continue organizing events and conferences for further research in the field of Healthcare.